For Smart Bro users who want to check their remaining balance on your account there are two ways on how to get those details. The first method is via SMS, all you need to do is type or text the code to a given number. Second is via online, you check all your Smart account details, including Smart Bro by creating an account at Smart Connect. Most users preferred using SMS for balance inquiry as it's simple and easy compared to online where you need to create an account then add your prepaid or postpaid number before you can manage your account. For USB broadband and WiFi modem, just plug-in your Smart Bro (Plug-it, Starter) device to your laptop or computer then wait for the dashboard to open or initialized. After initialization, go to message tab where you can create or type an SMS text, then type the code on the steps below to check your remaining data, text and calls. Wait for the SMS confirmation containing the details of your account expiry date and remaining balance. For those who want to check their load status you can check Smart Load Manager for details. The second is thru online, this is not as simple as the first method but you can fully customize and check the details of your Smart account even postpaid. You can also add multiple accounts by just filling in the number then input to link on your current Smart Connect account. 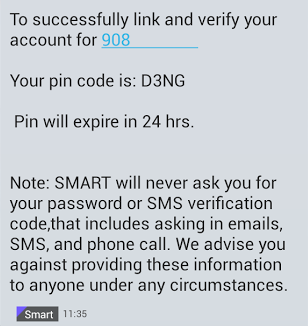 On your my.Smart account you can also manage phone and sim services, bills, avail data package (UnliSurf) and Call & Text promos. Fill up all the required fields and follow the sign up process. Make sure to use active email account for verification purposes. Open your email account and click the verification link sent to your inbox (Do check also Junk Folder in case you haven’t receive the link on your inbox). This usually takes few minutes to arrive on your inbox folder. Input your desired password and continue to completing you profile details. On your account add your Smart Bro SIM mobile number then Proceed. A SMS notification will be sent to your inbox or on your Smart Broadband dashboard. Enter the PIN code to link the mobile number on your web account. Once steps above successfully done, you can automatically view your account balance. Details include the amount, expiry date and time. Smart Bro dashboard also has a one-click balance inquiry on home menu and links to your web account. For modified or updated dashboard you can use text method and online inquiry.